Sunday, June 17th was a hot, sunny day in Toronto, reaching a high of 40°C with humidity. 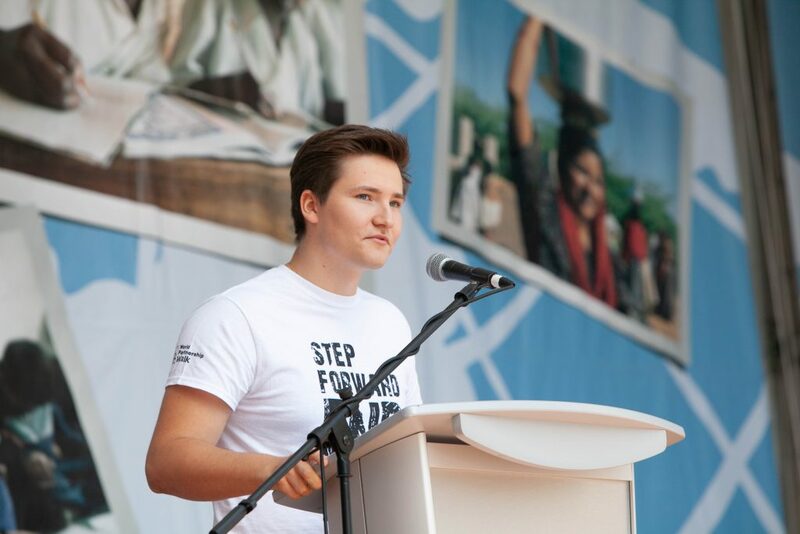 Like every year, thousands of people gathered to share their commitment and celebrate their successful efforts to raise funds and awareness to end global poverty through World Partnership Walk. This year, however, the atmosphere at David Pecaut Square was different: a palpable sense of excitement ran through the growing crowd of walkers and volunteers. Prince Aly Muhammad is the youngest son of His Highness the Aga Khan. He was present to support the Walk and to meet some of the many Canadians who contribute to improving the quality of life in some of the poorest and most remote parts of the world. In his remarks, Prince Aly Muhammad spoke passionately about a recent trip to witness the challenges of global development firsthand – and speak with the individuals and communities working with the Aga Khan Development Network to lead positive change in their societies. Written, directed and voiced by Prince Aly Muhammad, the short film “Close to Home” (English only) is his personal account of his discussions with communities in northern Pakistan, and how the AKDN is partnering with them to find solutions to the problems caused by a changing climate. The 2018 season of World Partnership Walk may be over, but the fun-raising has just begun! Check out our Fundraise My Way page to see how you can mobilize your passion to end global poverty. In his welcome remarks, Toronto Mayor John Tory, a long-time supporter of the Walk, applauded the exceptional work of the World Partnership Walk in contributing towards life-changing initiatives. He concluded by proclaiming June 17 as World Partnership Walk Day in Toronto. Held annually in 10 cities across the country, World Partnership Walk is Canada’s largest public movement to fight global poverty. Started 34 years ago in Vancouver, the Walk has raised more than $100 million to support AKFC’s development programs in Africa and Asia – unlocking the potential of millions to build a better life.